How would you like to sip, savor, and stroll while shopping and enjoying special promotions with gifts at participating retailers for a good cause? 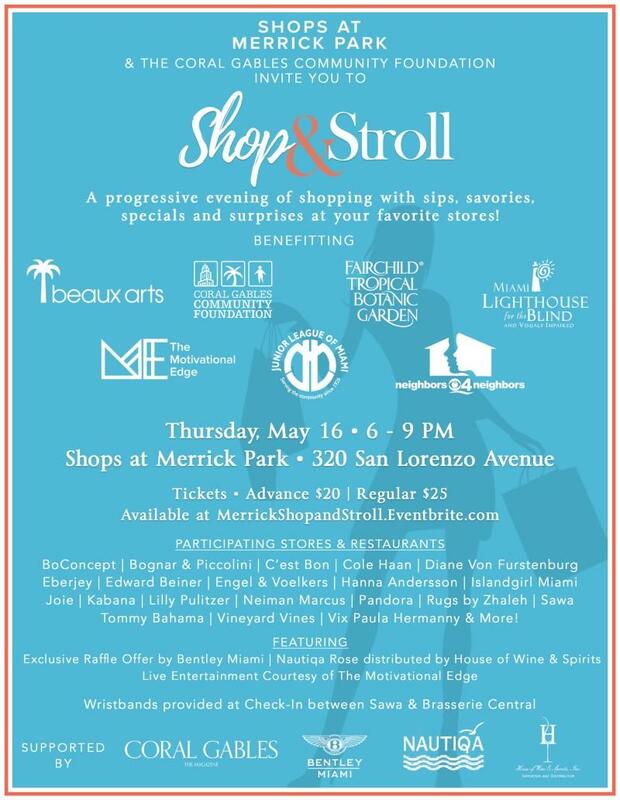 Well then, Shops at Merrick Park's Shop & Stroll is the event for you on May 16 from 6-9 p.m.! Come with a friend or gather a group to support several area charities including Coral Gables Community Foundation, beaux arts, Fairchild Tropical Botanic Garden, Miami Lighthouse for the Blind, The Motivational Edge, Junior League of Miami, and Neighbors 4 Neighbors including live musical entertainment. Tickets are available at merrickshopandstroll.eventbrite.com.